Sailing on a traditional Indonesia Phinisi boat will give you more authentic sailing experience. As the biggest archipelago in the world, living aboard is one of the best you can get to explore the islands and enjoy all the things you can do. As East Nusa Tenggara province is also an archipelago, then your have to considering the best Komodo liveaboard package for your next trip. Dragons are no longer a myth when you are visiting the Komodo Island as the most popular island in the world to see the Komodo dragons. There are also other islands for that and many of them are the arid and uninhabited islands located at the Lesser Sunda chain of islands and forms part of the Komodo National Park. A perfect islands for the dragons whom aren’t breathe fire and no wings to fly. But, as the wild animal, dragons can also be so dangerous as the reptile who are even eat their own. Still, many tourists are keep on coming to see that ancient animal. The only access how you will get to those islands is by boat. The water is dominated most of the region, so cruising on a boat will be the thing you have to deal with. And since Indonesians are proud of their own Phinisi boat and ship design, that can be the best Komodo liveaboard package you can take for couple of days ahead. Why sailing with Phinisi boat can be your best Komodo liveaboard travel package? 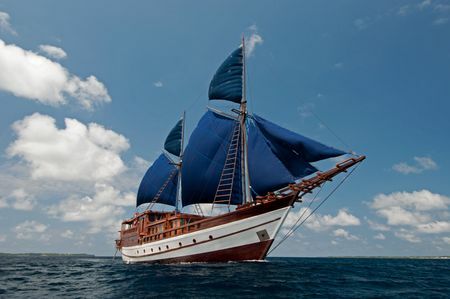 Unlike the dragon myth, the best Komodo liveaboard using Phinisi boat is the real thing. Phinisi is the real boat legend in Indonesia’s maritime history. The extent of Indonesia’s territorial waters has resulted in the birth of many tough sailors who had been sailed through the world’s oceans. This boat is made by the tribe of Bugis at the province of South Sulawesi. In fact, the center of phinisi shipbuilding is also still there up to this day, precisely in Bulukumba Regency. It is the sailing boat where there are 2 sail poles, one at the behind and at the front of the boat’s deck. If there will be 2 poles with 7 sails, history tells us that it is representing the 2 sentences creed (Syahadah in Islam) and the 7 sails are representing the numbers of letter (Surah) in Al-Fatihah. But, the boat shouldn’t consists of 2 poles since you can also may see them with only one sail pole only at the front. As a whole, phinisi boat is representing the glory and toughness of the Indonesian sailors and people on the sea. And most of its boat designs are safe for passengers, and have a big open wide deck where you can see all the corners of the boat along with the seascape and view. That’s why using the phinisi boat on your Komodo Island travel package can be the best Komodo liveaboard ever. There are rooms for even up to dozens of the passengers, so your islands exploration can be done in a group if you need it. In the past, most of the Phinisi boats are used for trade. The goods will mostly placed under the deck. But now, they can also be used as the passenger boat and even as the luxury cruise. There are many of the traditional boats in Indonesia have been changed into the commercial boat for the island exploration funded by the local or even the foreigner investors. That’s also happening in where the dragons are living, islands around the Flores seas. Many of the travel agents are utilizing the authentic value of phinisi ship to be combined with various travel packages they are offered. The boat design still inspired by the Phinisi, but in more luxury ways where the furniture, interiors, deck and all the boat exteriors are look luxurious. So that, if you need to get to experience the Komodo Island and the other islands travel package, then you’d better get your own best Komodo liveaboard package that will serve you on the phinisi boat since the beginning of your island explorations.